Dun dun dahhhhh the day has come friends, the day has come. 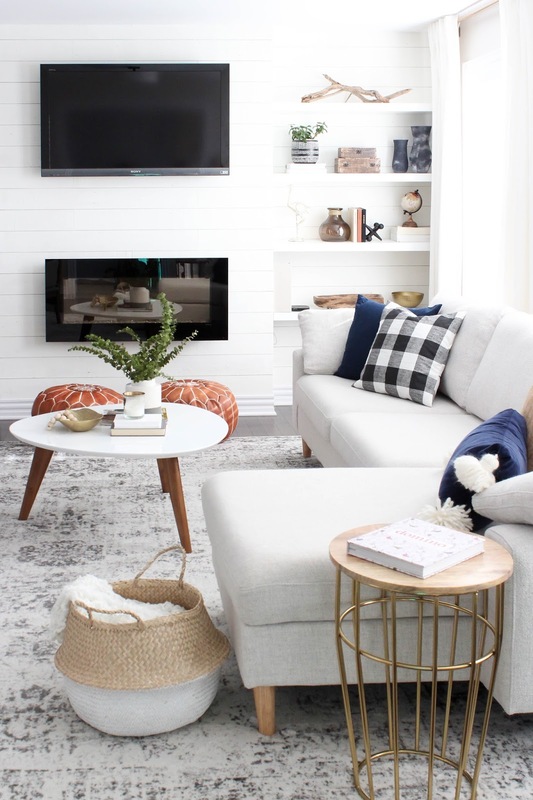 I am SO exited to share our family room makeover with you all today and let me just say that this room has been a labor of love. Like most projects there were some unforeseen's that came into play which is always inevitable in any design project. You just have to accept and let it go which is why this seemed like it took a little longer then planned. But hey, we're here, it's done so let's get to the good stuff right?! Let me first start off by saying that our previous design of the room was something I had began planning while we were building this house and I basically anticipated how I thought we would use the space but of course, you never really know how a room is going to function for you and your family until you are living in the house! So I found that the set up we had which was a sofa and two chairs just ended up feeling a little more formal then I had originally invisioned. 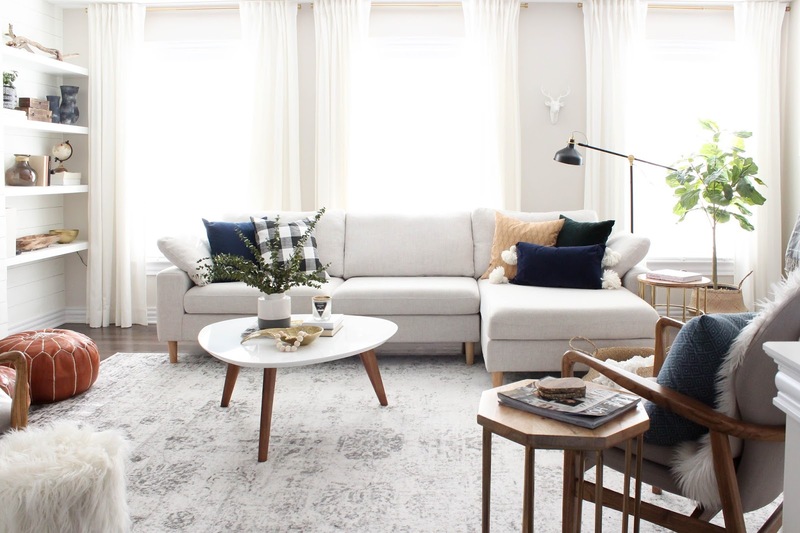 We needed a high performing family piece of furniture that we could all curl up on for family movie night, yet it still felt clean lined and mature for when needed the room to function as an adult space for entertaining. Well let me just say we hit the jackpot and this modern sectional has met all of our family lounging needs. 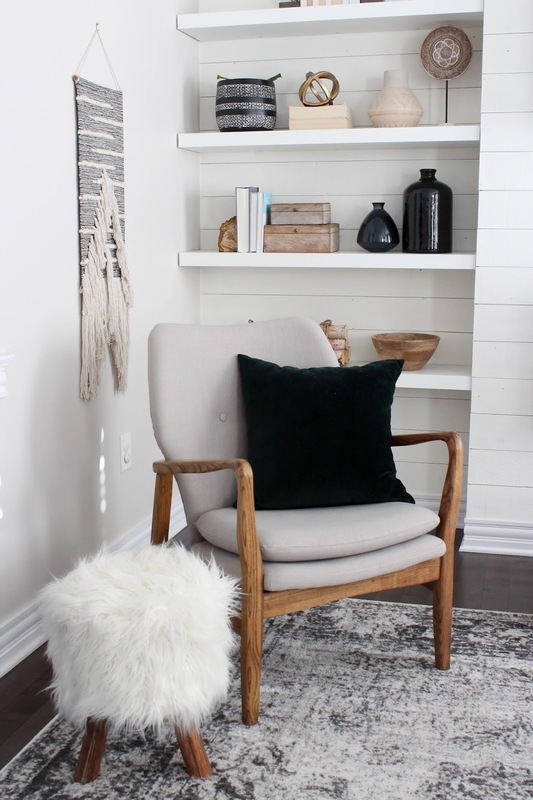 I lam so happy with how the room has come together and probably one of the biggest impacts in the whole space is the shiplap feature wall using one of my favourite products of all time, Stikwood. Now this was a project that took some time simply because I wanted the whole wall done including the edges of the build out but I have to say, Stikwood is legit a game changer in creating these wood feature walls guys you need to try it! I used it in my son's room for the One Room Challenge earlier in the year and it was just an easy install this go around making a wall of this size so much easier to complete. 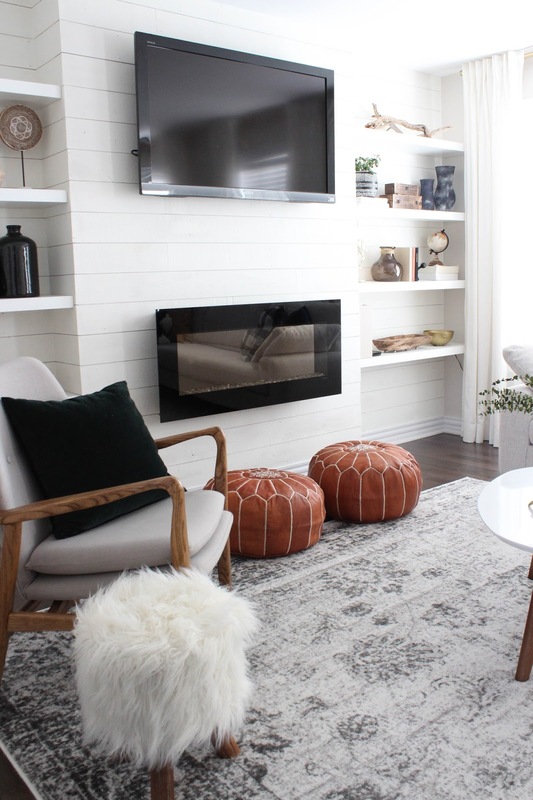 I really wanted the shiplap look but not your classic perfect style- I love that the Stikwood is super textured and has imperfections making it feel really cozy and just the perfect backdrop for a family space. 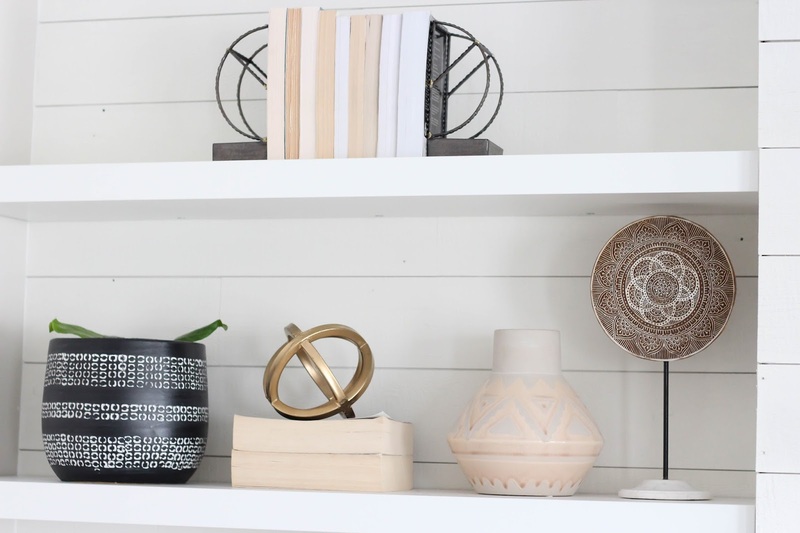 Now if you take one look closer at those lovely shelves on that shiplap wall you will see they are styled with all kinds of pretty pieces that are all from my favourite store ever, Homesense. 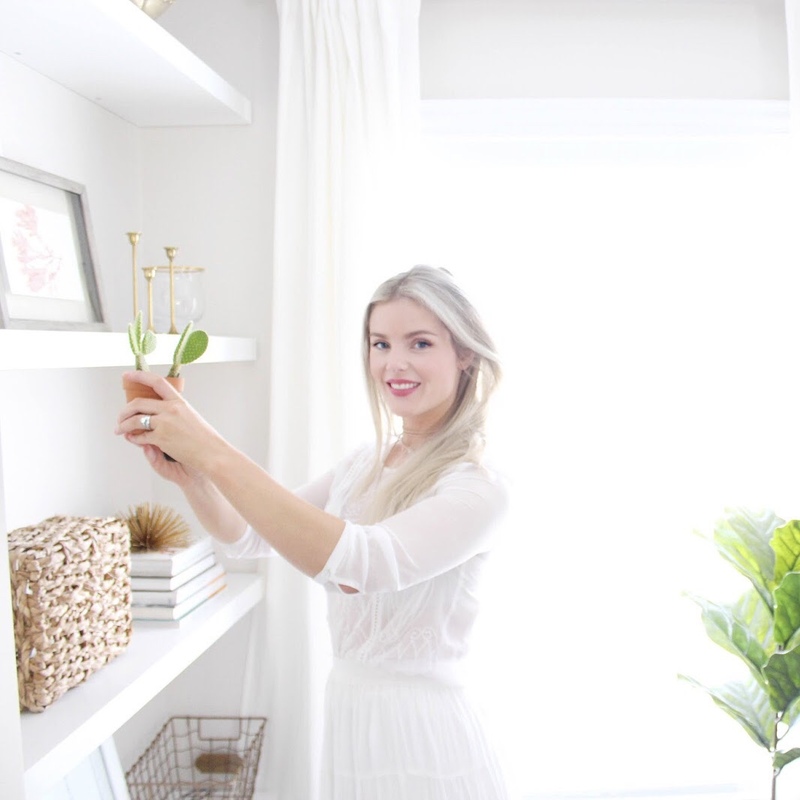 I partnered with Homesense on these shelving accessories and let me tell you, I have never enjoyed a shopping trip more! 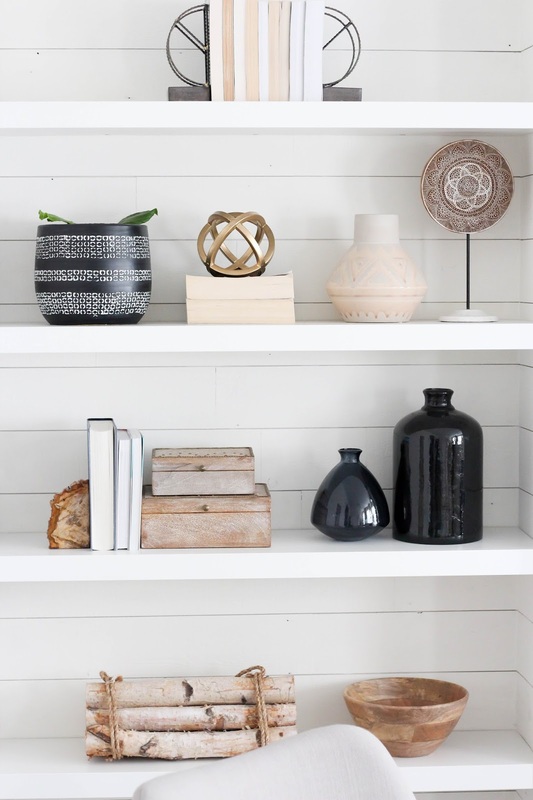 You can always find everything you need there and I always end up coming out with more then I intended simply because there is just so much great stuff, it's always my first stop with design clients. 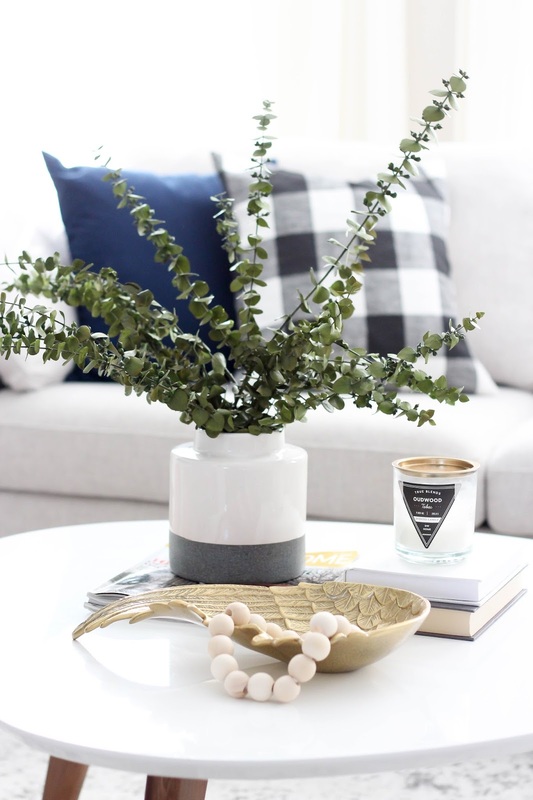 This Beautiful eucalyptus is from Girliture and I am so in love with how it look's bunched up in a vase. 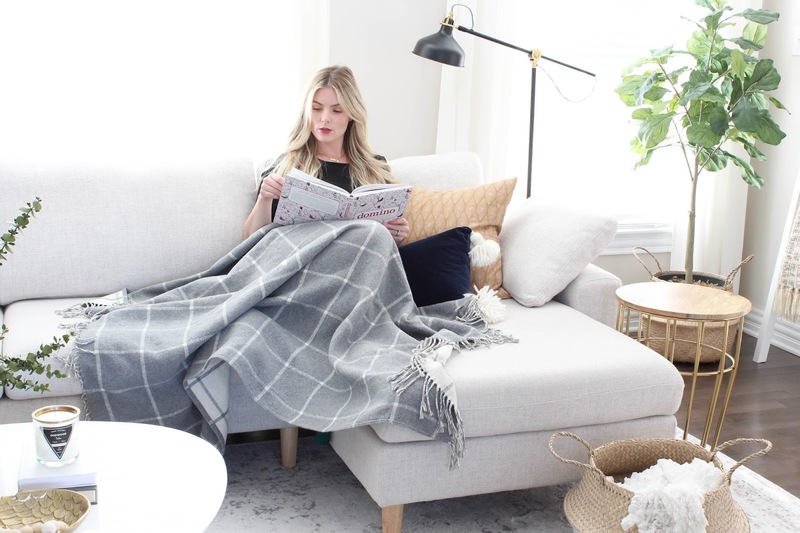 The woven wall hanging and belly baskets are from her shop as well and are perfect for storing blankets, magazines or your floor plants in. Back when I received our new vintage style rug I shared it on Instagram stories and you guys all sent me sooo many messages about it! 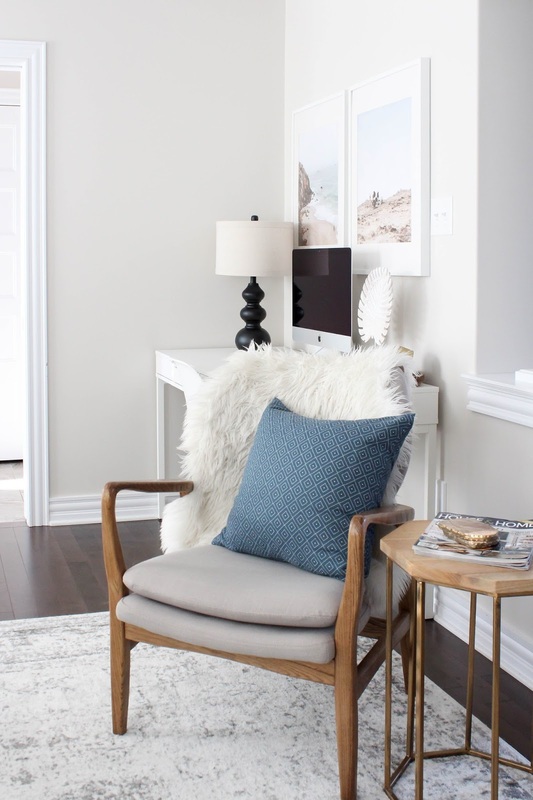 I am always a bit nervous ordering vintage style online because you just never know exactly how it's going to look but let me say, this beauty is a winner and is the perfect mix of grey and white distress, so much so that I am thinking of getting one for the bedroom! 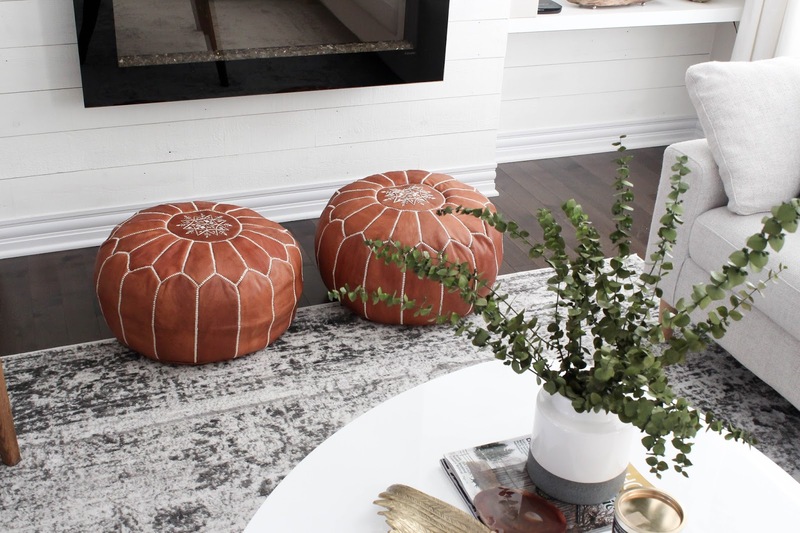 These two cognac Moroccan poufs are from the sweetest shop called Marrakeshine and they were exactly what I was looking for to layer in front of the fireplace. The colour brings in great warmth they are so soft and perfect if you need an extra seat in a pinch or simply just want to pop your feet up to be even more comfortable! 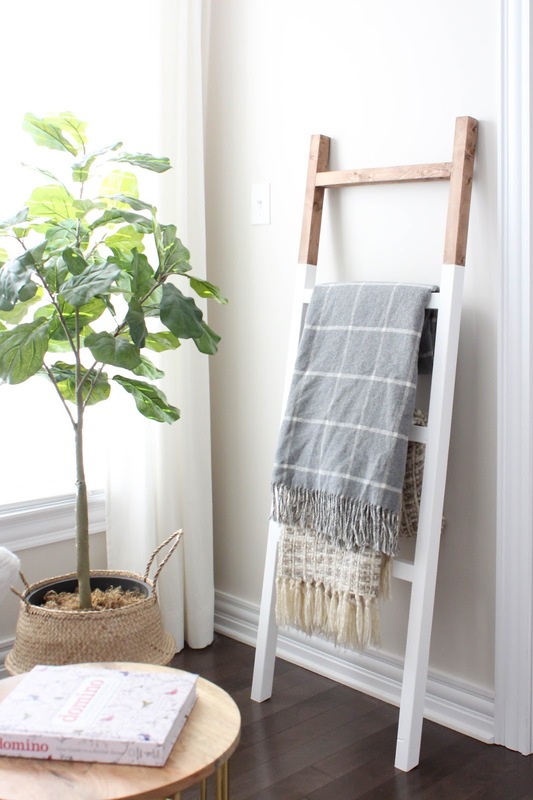 Also can we just talk about this blanket ladder?! I teamed up with local building design company Power Designs and we created this custom, modern, two toned blanket ladder that is just my dream piece- I am actually going to be giving one away to you guys this week so stay tuned for that because you won't want to miss it!! 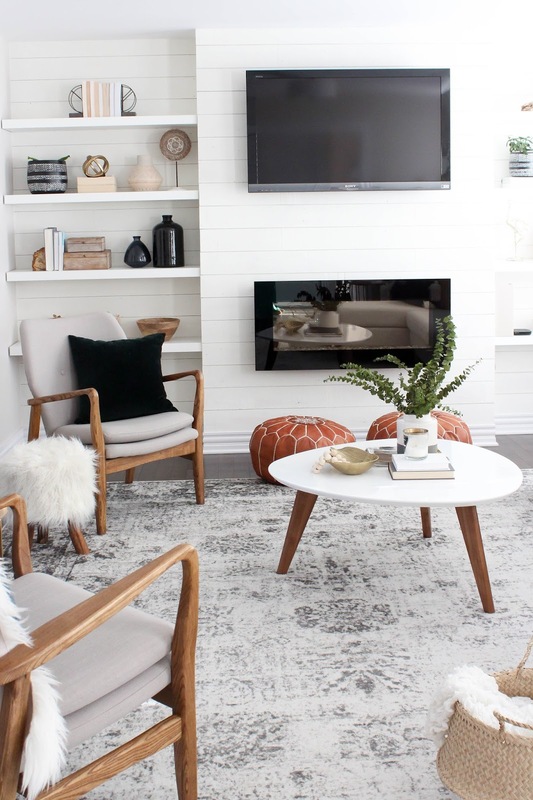 I hope you all enjoyed this reveal of our family room and make sure you stay tuned for the giveaway happening this week! This post contains sponsored product however all opinions are my own. Thank you for supporting the brands that help support this blog. 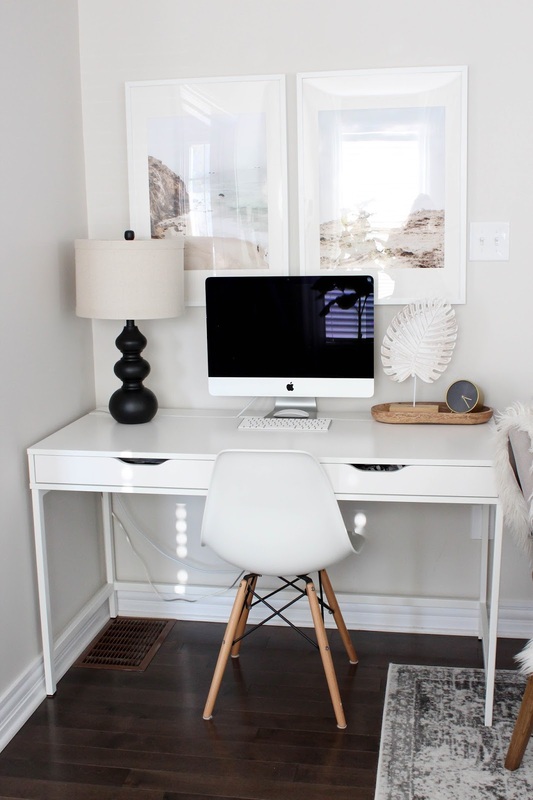 I absolutely LOVE everything about this room - the style, the furniture, the decor! The couch is by far my personal favourite. Thank you much! Yes we love our sectional it has been life changing haha! Can I ask where you got it from? 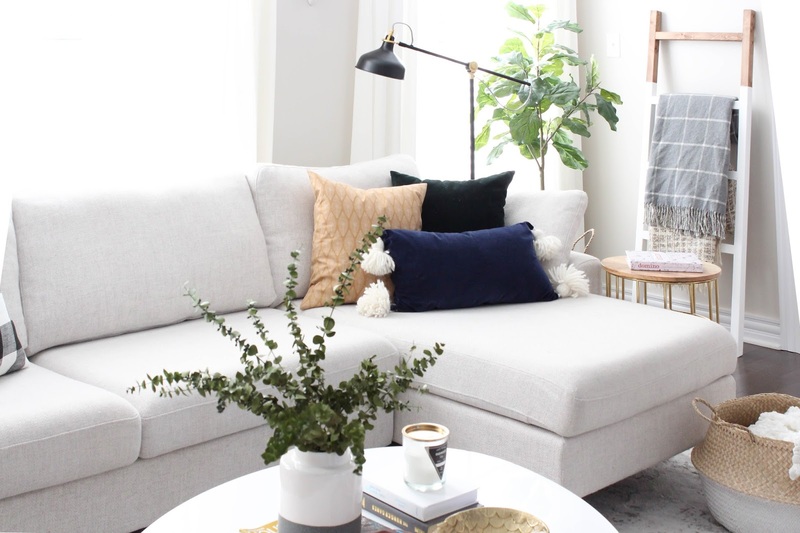 Definitely looking for something very similar to that sectional. 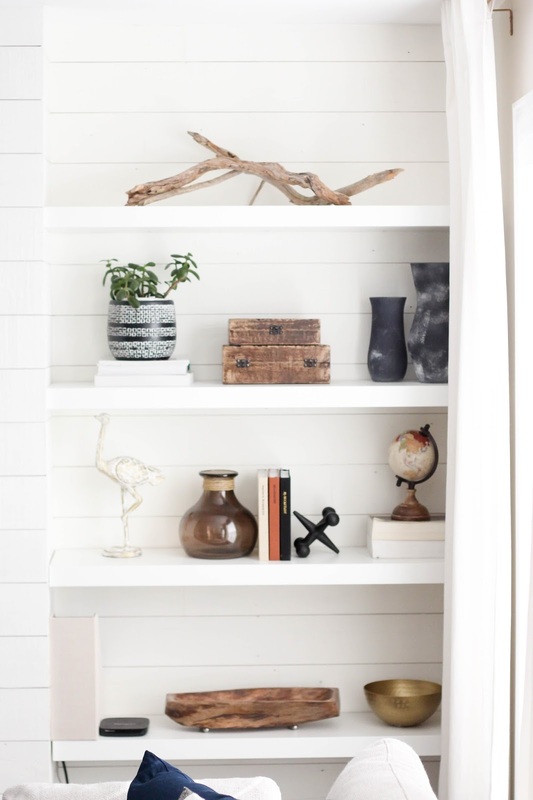 What is the paint color on your walls? I’m hoping to paint our main living space a lighter color but I have off white kitchen cabinets so I don’t think I can do grey but white might make the cabinets look dirty- but I think your color would be perfect! Thanks Katelyn! :) you could probably do the right shade of grey if you really wanted to as long as it wasn’t too cool toned! My colour is BM Pale Oak and I love it. BM Classic Gray is also another one of my go to’s! Love your room makeover, where did you purchase your sectional from? I love your sectional! Is it the HENRI sofa from structube? :) - also, where did you get your rug from!? Beautiful! 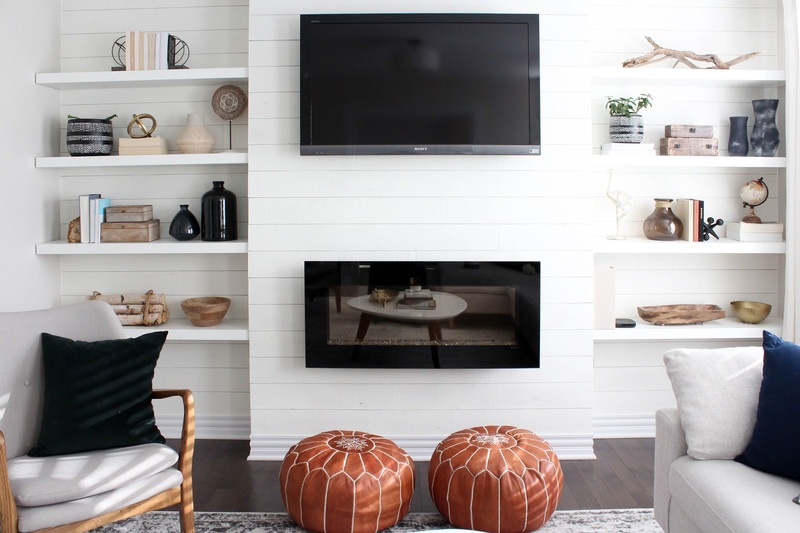 Did you paint over the Stikwood panels with white paint or is that the Hamptons style sold on their website?